The Bible is filled with so many characters. Many times we usually think of the major stories that we grew up hearing, but what about the other characters? Those not so known characters that people who are new to the Bible don’t know. Today’s focus is on Bible characters who inspire you. 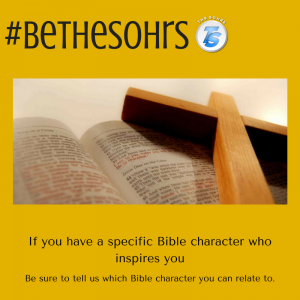 Tell us about a Bible character that gives you inspiration. It’s time, your time, to BeTheSohrs. Let’s show the world the character from scripture that inspires us. Share on Facebook, Twitter and Google+.